Hi all! We had a great day in St. Maarten. What a beautiful port! We booked an excursion through Shore Excursioneer called Beach Bum Combo, which took us to Orient Bay Beach and Maho Beach. Our tour guide was very informative. Orient was beautiful. It started out windy and cloudy, but about half way through our time there, the sun came out. Apparently the weather we were experiencing on the ship the day before, also hit the island as bar owners there were telling us how they had to close due to the wind. There are an immense amount of water toys and activities to do there as well as paddles, which offer massages and items to buy. There are signs in the bathrooms telling visitors not to engage the paddlers. We grabbed a Guavaberry Colada while we were there....which I wasn't a fan of. Next up, we went to Maho Beach which was something on my bucket list. Wow wow wow!!! We went right to the popular restaurant there and scored a great table. Side note...they have amazing pizza and their pool costs $5 a person. We were able to watch the planes coming in and taking off from our table. We then we headed to the beach. The tide is insane there. You get pulled in and out without moving a muscle! To say I brought back half the beach in my bathing suit is an under statement! 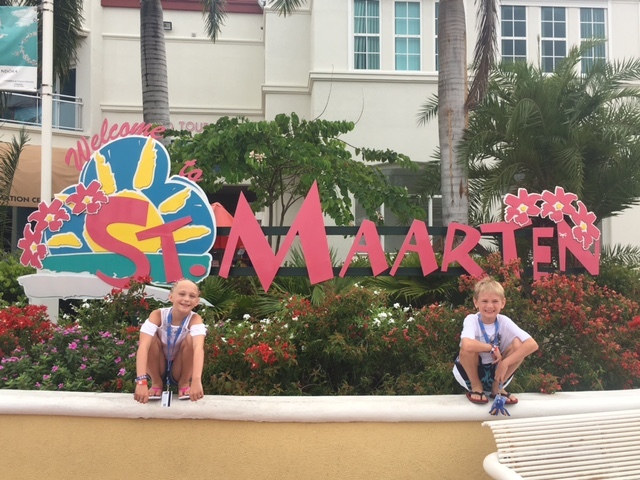 After heading back to port, we did some light shopping and then headed back onto the ship to grab our last dinner (lobster night), swim one last time, spend the arcade credits, get our picture package disk, and on and on! Busy night!! !